Jon B. Olson, pastor of Lutheran Campus Ministry at Minnesota State University, Moorhead. Tia Mathre-Adams, director of Lutheran Campus Ministry for San Antonio area colleges and universities. Becca Seely, director of Lutheran Ministry in Higher Education of NYC and pastor of The Vine NYC college ministry. Ben and Kristen Eisele, pastors of the Luther Center at the University of South Dakota, Vermillion. Jon B. Olson: I meet with students to plan activities; preach at weekly worship; listen and provide pastoral care; plan retreats, mission trips and service projects; help secure funding for the ministry; build relationships; and share our ministry story. Tia Mathre-Adams: Our ministry field includes more than 100,000 students across 31 institutions of higher education in the San Antonio area. My primary role is to be a good listener, and I bring the word to our students. We worship, dine and serve together, and share conversation. Becca Seely: I serve as the pastor of a New York City-wide college ministry network, which is supported by local Lutheran and ecumenical partner congregations, so I spend time building relationships with partners passionate about ministry. I lead a weekly dinner church worship, meet with students and facilitate “Table Talk,” a program where students meet to talk about issues of faith and life. Ben and Kristen Eisele: Worship, meals, book study, care and counseling, being a resource for deep questions, and dreaming with students about what the Luther Center can be. What led you to take a call at a campus ministry? Olson: Many years ago, I served on a campus ministry board at North Dakota State University, Fargo, so I was familiar with the nature of campus ministry. 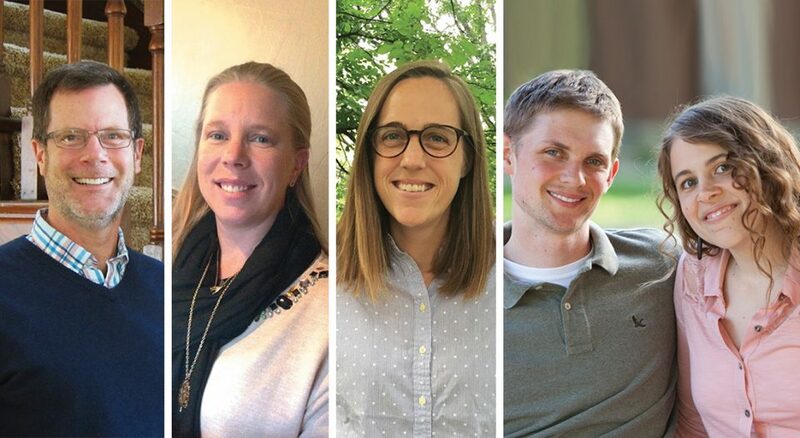 Two years ago, Lutheran Campus Ministry at Minnesota State University, Moorhead, was going through a difficult period and was looking to rebuild its ministry. I felt God nudging me to use my gifts to help rebuild this ministry and to work with a great group of students and board of directors who were committed to making the ministry healthy and strong once again. Mathre-Adams: My passion for Christ and emerging adults. I believe it’s our most critical ministry. Transitioning adults seek support and guidance, and I am grateful to accompany them on their faith journey. Seely: I wasn’t raised in church, and I first became interested in exploring questions of faith and spirituality while taking religion classes in college. I came out as gay in high school and was really turned off by the judgmental Christianity I saw around me in my adolescence, but as an undergraduate, reading Christian theology and literature opened my eyes to a new way of understanding Jesus and Christianity. During this time of spiritual exploration, there was no welcoming Christian community on campus I could turn to with my questions. I’ve found this is true on most campuses, even in New York City—especially when it comes to LGBTQ students. As a result, I am particularly passionate about helping to build Christian campus communities that are boldly inclusive and offer a different witness to Christian faith than the conservative evangelical one that pervades our campuses and the media. The Eiseles: We didn’t start or finish seminary thinking we’d be campus pastors, but then again, at one point in our lives neither of us thought we’d go to seminary or be pastors. Such is the Holy Spirit. We both worked college admissions at Augustana [University, Sioux Falls, S.D.] and Luther [Seminary, St. Paul, Minn.], so we’ve had some consistent contact with this generation. It’s an unexpected fit. Some days it’s a square peg-round hole fit, but the edges are being molded. What are some of the biggest challenges facing college students? Olson: Many college students are in a time of discernment. They are asking questions about vocation, relationships, sexuality and faith. Campus ministry can provide a healthy, safe, Christian environment where they can explore the important questions without being judged or shamed. Mathre-Adams: Last year a graduating student told me that she felt like she was going through a “quarter-life crisis.” I believe this crisis stems from the misconception that students will land their dream job upon graduation. Campus ministry offers a place of grace where students can be fed and heard. Seely: They are incredibly achievement-oriented. They never slow down and being busy is almost a status symbol for them. Campus ministry offers them the amazing gift of a space to just be—to be welcomed and accepted and loved regardless of what they have or have not achieved that day or week or year. The Eiseles: Their world becomes a bit bigger, and assumptions about who they are, what they’re going to be and their faith become closely examined and likely challenged. We tell our students not to let anyone tell them that their lives as students isn’t the “real world” because their work, their questions, their relationships all matter. From your experience working with young adults, what will the future of the church look like? Olson: As I work with young adults and think about the future church, these words come to mind: authentic, accepting, nontraditional, risk-taking, service-oriented, emphasis on community and diversity, passionate faith. Mathre-Adams: I think the future of our church is bright. Our church is ever-changing, and we are learning more ways to make connections and build relationship bridges with others, Lutheran or not. Seely: Less institutional and more like the early church—smaller communities of people gathering together to praise God, share life’s joys and challenges, and make an active difference in their communities. I am hopeful about any future church that reflects the qualities I see in my students: honesty, passion, a thirst for justice, and a deep longing to know and be transformed by God. The Eiseles: If the future of the church is in the hands of the young adults that we work with, then the future of the church is in good hands. Of course, the future of the church is in God’s hands, and from what we know of God’s work through the Spirit, we can predict that the future of the church will be unpredictable: surprising, challenging, alive with the promise of Jesus’ love and forgiveness. What is one misconception you think people have about the faith lives of young adults? Olson: I think many people believe that young people today have no faith and have no interest in matters pertaining to God or the faith community. This is simply not true. Mathre-Adams: The assumption that all young people were raised in a Christian environment. Another misconception is that we tend to think that people will accept our belief system. Respecting the faith of others while sharing our faith is a growth opportunity toward unity for us all. Seely: That most young adults are “spiritual but not religious” and primarily want to talk about God and faith insofar as those ideas relate to their own feelings and self-fulfillment. As a campus pastor, I have discovered a real thirst for knowledge, truth and tradition among young adults. The Eiseles: That they don’t care about the church, their faith, the world, whatever. Or that they’d like to be a token inclusion into church visioning. Faith is wide and wild, less to be figured out and more to be waded, floundered, swam in. It could be that few are testing those waters more than young adults. What is something ELCA members and congregations can do to connect with campus ministries in their communities? Olson: Call up the campus ministry site nearest you and volunteer! Give of your time or financial resources. Many may not know this, but Lutheran Campus Ministry does not receive funding from the universities we are associated with. Our funding comes from individuals, congregations, synods, [Women of the ELCA] groups, foundations and others. Your financial support is critical to keeping our doors open! Mathre-Adams: ELCA members can find their nearest campus ministry through our national Lutheran Campus Ministry network. If you’re in the San Antonio area, please join us for dinner! This is a ministry of accompaniment, so simply sharing a meal with us would have an impact on our ministry. Seely: Contact your local campus pastor and ask if you can help provide meals, supplies, space or people power. Invite your local campus ministry to participate in your congregation’s service and justice projects. If a college student shows up at your congregation, let them know about the local campus ministry. Invite your local campus pastor and some students to come share about campus ministry on Sunday morning. Most urgently, campus ministries are under a lot of financial pressure. Unlike a congregation, member giving can’t sustain them and a lot of denominational funding has been cut. Take an offering or make a congregational gift or grant if you can. It’s not only a way to serve our student neighbors right now, but it’s also an investment in the future of the church. The Eiseles: Go to your local campus ministry and ask this very question. The obvious might be financial support, which is often needed and always appreciated. But imagine beyond that. If the college or university makes up the bulk of your community’s context, imagine how to coordinate your ministry efforts so that you’re complementing and not competing for attention or students. Ask if there’s a real need (not merely a presumed one) to be filled by you or your church. Conversely, if there’s a need in the community or in your congregation that you’ve identified, share that with the campus ministry. Connecting points may be surprising. They probably will be, if the Spirit is involved. What’s one thing you’ve learned from the young adults with whom you work? Olson: Sometimes you just have to eat six slices of pizza and not worry about the carbs! Mathre-Adams: One thing I’ve learned from the emerging, transitioning adults with whom I work is that there is hope. One of the most surprising things to me is how actively God is working through us and our ministry. Life is about our experiences, and the best memories are formed when we least expect them. The Spirit moves in mysterious ways, and I am grateful to be along for the ride! Seely: There should be more laughter in our sacred spaces. I love that my students don’t have a “church self” and an everyday self but bring all of who they are to worship and share it in praise of God. The Eiseles: That they’re hungry. Sometimes literally, but also spiritually. And like different palates, there are different preferences and practices and places in which their faith is lived out. There isn’t a box or label that captures students or young adults as a whole. It’s a living body, like the wider church, except the congregation and leadership turns over with regularity. There’s always something new. In addition to worship services, what are some other programs or opportunities organized by your campus ministry? Olson: There is a student-planned spring break mission trip every year. There are monthly fellowship events, such as a movie or game night. Every Tuesday we offer Lunch for a Buck, and on Wednesday nights before worship there is a free supper. We hold a retreat toward the beginning of fall semester to help students connect with one another and build relationships. We volunteer at events on campus that are geared toward the LGBTQ community to communicate that we welcome and accept all students, including the marginalized. Mathre-Adams: We serve the homeless food through Taking it to the Streets, a joint ministry. We share experiences like Vespers at Texas Lutheran University and Movies by Moonlight at Hemisfair Park. We share our ministry through the Student Involvement Fair at Trinity University, and we have free, weekly homemade dinners for our students every Wednesday of the academic year. Seely: At midterms and finals each semester, our ecumenical branch at Columbia University hosts a huge Midnight Pancake Study Break for hundreds of students with live music and exam care packages for students. We meet monthly for Table Talk, a coffee shop theology program to discuss issues of faith and our world. We take an annual retreat to the Catskills. And our students are currently organizing regular teach-ins about pressing issues in our world and how to respond as Christians. The Eiseles: For the homecoming Dakota Days parade, instead of throwing things out to the crowds, we push shopping carts to collect donations for the Vermillion food pantry, calling it ’Yotes [short for the Coyotes mascot] Tackle Hunger. We ring bells, collecting donations, and worship with a local prison congregation. We feed students at busy points in the academic year. Bible and book studies also happen.